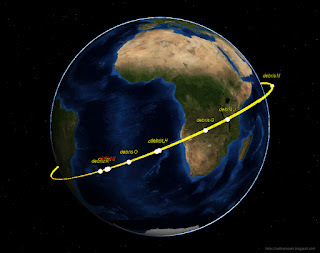 In a previous post from a few days ago, I discussed the debris shedding event of the Japanese scientific Hitomi/ASTRO-H satellite (2016-012A) on March 26, ~01:42 UT, that is currently in the news. As things have developed, it appears that the picture has become more grimm, as the available data now seem to indicate a real break-up rather than just "some" debris shedding. If true, then Hitomi is beyond saving. On Friday, JSpOC published the first elements for 10 fragments produced. As part of it, the "A" identity (the largest remaining part of the original satellite body) was shifted to another object: what was assigned to be the remnant of Hitomi in the first few days, turns out to be not, but was the fragment now labelled "L". It was this fragment which was observed tumbling with a periodicity of 11.75 seconds. As it is rather bright, it indicates that Hitomi broke into at least two large pieces (I think it is actually three, as fragment H also seems to be large based on the NDOT/2 value) plus a lot of smaller fragments. Some clustering might be present in these speed data, roughly into three groups: a number of fragments yield low velocities in the range 0.3-0.5 m/s. Fragments L and H have ~1.3-1.4 m/s. And there is a group with high speeds from ~4 to ~14 m/s. I performed a conjunction analysis using the first two to three published element sets for each fragment, and Rob Matson's COLA software. For a given fragment, I looked for the element sets with small miss distances and relatively low ephemerid ages relative to the calculated conjunction. The result is in the diagram below. Note that some fragments appear twice in the diagram, as they sometimes yield two equally well fitting close approach times. There clearly is scatter and ambiguity in the results. 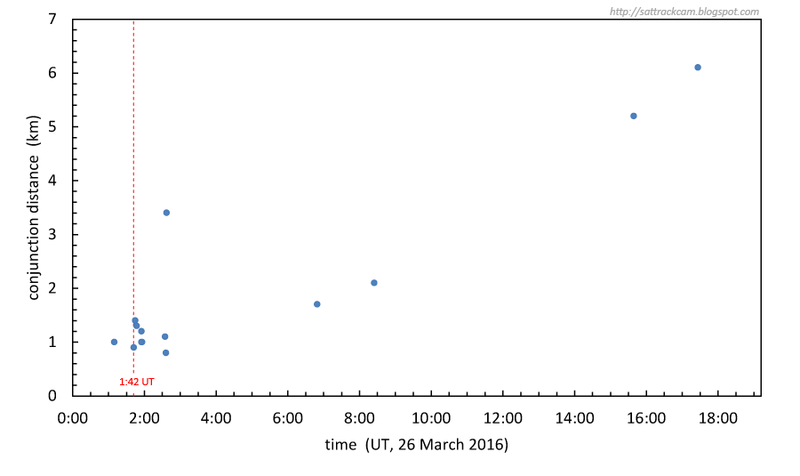 The data nevertheless show a clear cluster close to the estimated time that JSpOC published, 01:42 UT on March 26. The strongly deviating times to the right in the diagram are probably inaccurate and concern small fragments with a quick orbit decay (large NDOT/2 value), the reason why they are less accurate. I find it interesting that the A fragment seems to plot somewhat earlier than all the others, near 01:10 UT, but think it is wisest to chalk this down to orbit inaccuracies. Ted Molczan has argued for a possible second debris-shedding event at ~02:35 UT, near the next perigee passage. Fragment K, but in my opinion perhaps also P and Q would fit this time (P however also loosely fits to the 01:42 UT cluster. The Q fragment is probably small and has a larger miss-distance in the analysis, so might not be too accurate). 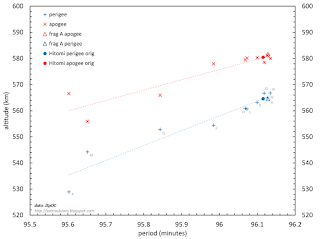 The relative position in the diagram with respect to the original values for Hitomi/ASTRO-H before the event happened (indicated by solid dots, one for apogee and one for perigee), is informative. Fragments plotting to the right and up of the original position are fragments that were ejected into the direction of the original satellite movement (prograde). They get longer periods and somewhat higher orbital altitudes. Fragments plotting to the left in the diagram, are fragments ejected opposite to the movement of the satellite in its orbit (retrograde). Fragments ejected perpendicular to the plane of movement of the satellite will plot in the vicinity of the original satellite values. 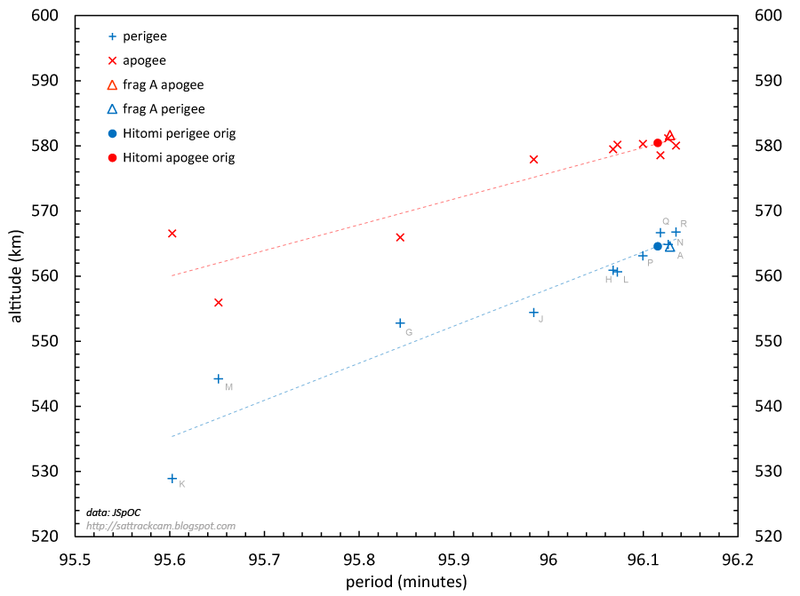 What can be seen in the diagram is that what is presumably the largest remaining object, fragment A, plots just right of the original Hitomi position: orbital period and apogee altitude slightly increased. A few more object plot around the original Hitomi/ASTRO-H values, but most of the fragments plot to the left: their orbital periods and orbital altitudes decreased. This includes the L-fragment, which based on visual observations and the NDOT/2 value relative to other fragments is likely a large fragment, as is probably fragment H.
I interpret this as follows: as indicating breakup from an origin somewhat behind the center of mass of the satellite (with respect to its direction of movement). This gives the heaviest remaining body (the A fragment), predominantly material originally located near/in front of the center of mass, a momentum in the direction of movement. Most other, smaller parts appear to have been predominantly ejected backwards, which is perhaps some indication that predominantly the 'rear' part of the satellite exploded with a notably backwards impulse. This still says little about the cause of the fragmentation. My primary suspicion is however that either the liquid Helium tank of the Soft X-ray Spectrometer (SXS) situated near the base plate in the middle of the spacecraft exploded, or the nitrogen pressure tank of the thruster system (I am not sure where the latter is situated in the satellite, I have not been able to trace that information so far). A preliminary analysis suggests that objects G and M will re-enter the Earth's atmosphere somewhere mid-April. [update 4 April 2016, 9:00 UT] My (and Google translate's) Japanese is abysmall, but this Japanese article seems to suggest the Helium tank indeed might be to blame, if I get it right. 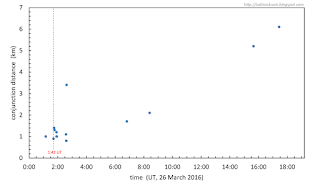 It also seems to suggest there was an attitude anomaly half a day before the main break-up, around 13:10 UT on March 25th. [update 5 April 2016 7:30 UT] Thanks to a translation by my friend Ton Kruijer and a Twitter comment by Nobuyuki Kawai: what the Japanese article from the previous update says is that JAXA rules out an impact as the cause and thinks something happened "internally", in the spacecraft. No definite cause is identified, but the article speculates about the battery and Helium tank used for cooling SXS. There are however no clear indications about the cause in the telemetry received before contact was lost. Yes . To avoid a repeat . Seems there was more than a anomaly in the attitude control system. Seems pretty clear now Astro H went into a tumble of death early on contrary to what JAXA was reporting early on. Form our observation on 4-2-2016 Astro H A fragment was showing a tumble that was passed it's structural safety margins which was faster than four seconds. Also believe at least one other fragment that we images showed signs of a cloud of debris flying along with it. Marco believe there was a battery explosion but believe a battery explosion in it's self would not cause the break up observed. What we guess happened is the battery explosion caused cascading failures in the spacecraft systems with either an over pressurization of the cryogenic cooling system cause a pluming or tank failure or a there was an impact from debris from the battery explosion on this cryogenic cooling system plumbing or tanks. Having been around high pressure system testing in industrial plants we can say when there is a failure of such a high pressure system it can be just like an explosion. Once there was this pressure release from the cryogenic cooling system it acted just like a rocket motor and caused the Astro H to spin up and go into the tumble of death and with high tumble rates structural break up. Also from a friend in Japan, this person told us, many of the press releases were for domestic consumption and should be viewed with some reserve and critical eye to what is being claimed. Then again until some how a close up look could be had of the satellite's remains and no telemetry after the event of real substance it may just be opinion and like behinds everyone has one. It's to bad the observation of the break up of the satellite by U.S. space tracking facilities in Florida have not be released publicly and what was actually observed.